Do you feel heel pain in the morning or after a period of inactivity? This might be an indication of plantar fasciitis that could be part of an underlying psoriatic arthritis condition. Psoriatic arthritis is an inflammatory arthritis that typically causes pain, swelling and stiffness in the peripheral joints or spine. However, if you have psoriatic arthritis, you may notice that not only are the joints and spine involved, but symptoms may also occur in the soft tissue such as tendons or ligaments. This usually happens in a place where tendons and ligaments attach to bone, known as the enthesis. When this attachment gets inflamed it is called enthesitis. One of the more common areas to get enthesitis is in the Achilles tendon. Another common area for inflammation is in thick band of connective tissue that runs along the bottom of the foot, known as the plantar fascia.When this gets inflamed, it is commonly referred to as plantar fasciitis. Usually you will feel heel pain that is worse with the first steps in the morning or after a period of inactivity, or worse at the end of the day. • The first immediate intervention is to decrease or stop any repetitive activities, such as running or dancing, which may aggravate the condition. • Ice may also help; rolling your foot over a cold water bottle or ice pack for 20 minutes, 3 to 4 times a day, can ease pain and inflammation. • Non-steroidal anti-inflam- matory drugs (NSAIDs), such as ibuprofen or naproxen, can also help to reduce pain and swelling. • Regular stretching is often beneficial, but may be difficult to do on your own; working with a physical therapist may help you to properly stretch the plantar fascia. • Orthotics (shoe inserts) may be helpful, especially if you have flat feet or a high arch. • Night splints may also be useful and work to stretch the tendon by putting the foot in dorsiflexion (pulling the toes up). • Medications or disease modifying agents (DMARDs) which treat psoriatic arthritis may help to treat inflammation of the plantar fascia. 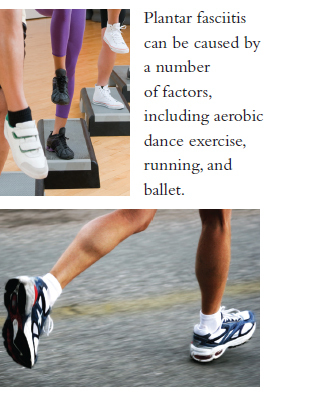 Despite these measures, your heel pain may persist and more targeted therapy may be needed. Corticosteroids (cortisone) are powerful anti-inflammatory medications that can be injected directly into the plantar fascia and can be very effective to locally reduce inflammation and pain. However, these should not be administered repeatedly, since repeated corticosteroid injections may cause heel pad atrophy or rupture of the plantar fascia tissue. If more conservative treatments fail, a fasciotomy or fasciectomy can be performed.This is a surgical procedure where the fascia is cut to relieve tension or pressure. In some cases, ultrasound guidance may be used to perform a less invasive percutaneous (through the skin) fasciotomy to treat plantar fascitis. make sure medication is properly delivered to the right location, avoiding multiple steroid injections, or to target appropriate surgical measures. As a forerunner in the specialty of rheumatology, the physicians of Arthritis and Rheumatism Associates, P.C. have been using musculoskeletal ultrasound (MSK US) since 2007 and are nationally recognized as experts in this field. ARA has incorporated the use of ultrasound as a diagnostic tool as well as a procedural treatment modality for aspirations and injections. While the technology of ultrasound has been around for approximately 50 years, it has not been widely utilized by rheumatologists until recently. With ultrasound our physicians can execute a procedure with more precision and more comfort to a patient.